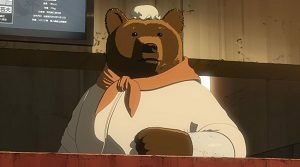 Knights of Sidonia was a series that passed me by when it first became available, but now with Madman’s release of the entire show on DVD, I’ve watched it from start to finish. 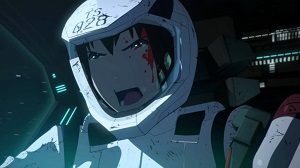 Set on the massive “seed ship”, the Sidonia, the series sees the remains of humanity deserting Earth after devastating attacks by the alien Gauna. The interior of the ship features thousands of houses all clustered together in vertiginous towers, closely resembling the architecture of the “Gravity Rush” game series. The massive Gauna entities regularly attack the ship, so the specially trained knights are sent out in their Gardes – mechs to you and I – with their Higgs-particle cannons and specially-designed Kabizashi lances for close combat. Even worse, the female characters are constantly damselled. Just about every time one of the women suits up in their Garde, you can be certain that they’ll need rescuing. It’s tiresome and predictable. The show also dabbles in the idea of a future society that isn’t bound to the gender binary. There is “third” gender that we meet in the very first episode. Unfortunately, it doesn’t do anything really interesting with the idea, and the idea slowly loses its significance as the show goes on. Series 2 has the narrative change gear, with some plot revelations that continue to be eerily similar to that other extremely popular anime of the moment. And once you get to climactic end of the season, be ready for an epic three-episode long fight that’ll have you on the edge of your seat, despite your misgivings. Watch Knights of Sidonia for the incredible production values, the top-notch action sequences and the great setting. You’ll have to turn a blind eye to the disappointing writing of the female characters, though. Knights of Sidonia Complete Series is available now on DVD from Madman. This entry was posted in TV Series and tagged Action/Adventure, Anime, Science Fiction, TV series by Stuart Wilson. Bookmark the permalink.